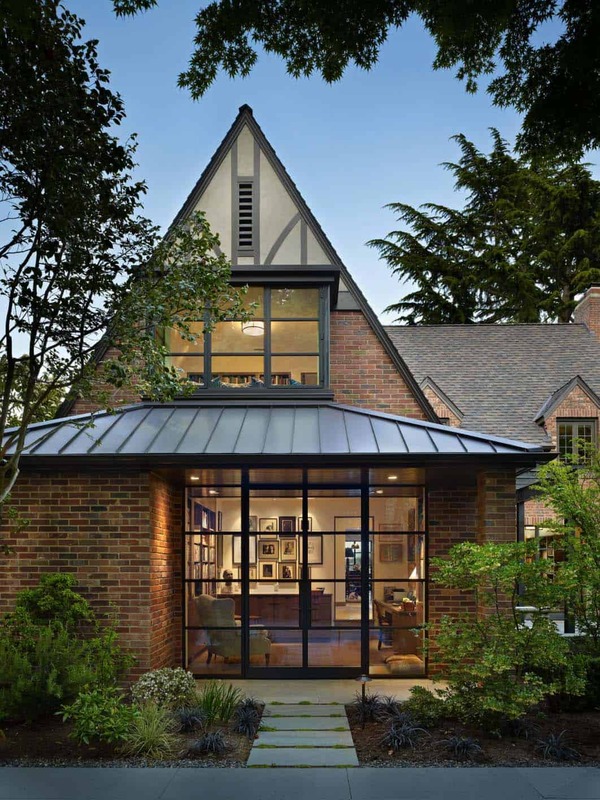 DeForest Architects was responsible for fully transforming a brick Tudor home into a stunning modern design, located in Seattle, Washington. A couple who love both books and dogs had been walking their dogs past this modest Tudor for several years before making their purchase. 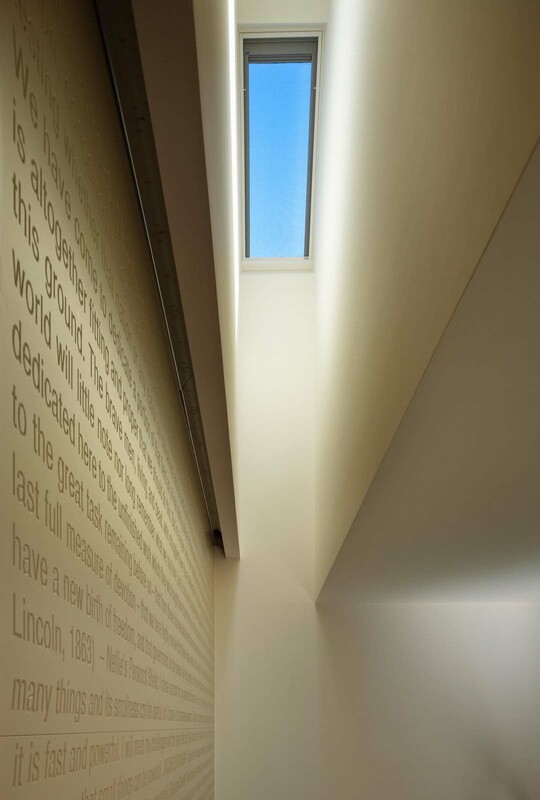 The project entailed this home breathe new life, built around their love of books, dogs and simple modern spaces illuminated by light. Above: The brick and mortar were from Mutual Materials. Brick: Stratford 2-1/2”x3-1/2”x7-1/2” New Used. Mortar: “Castle White”, and the architects added about 1lb of “Buff” per 90lb sack of mortar. The roof is Taylor roofing in dark bronze. The timbers are painted in Benjamin Moore, Bittersweet Chocolate (2114-10). 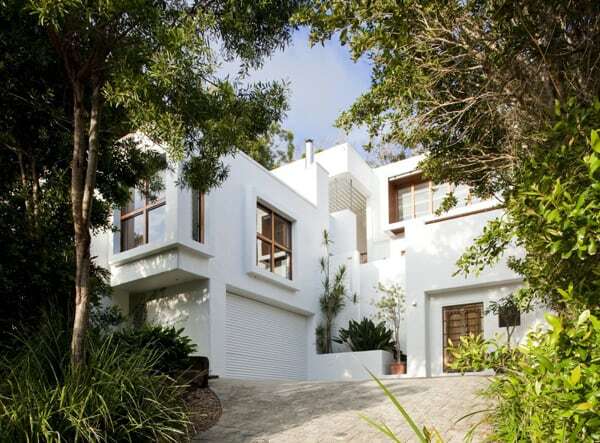 The stucco is an integral plaster color. If you go to your local stucco contractor, they can show you a palette of available standard colors. 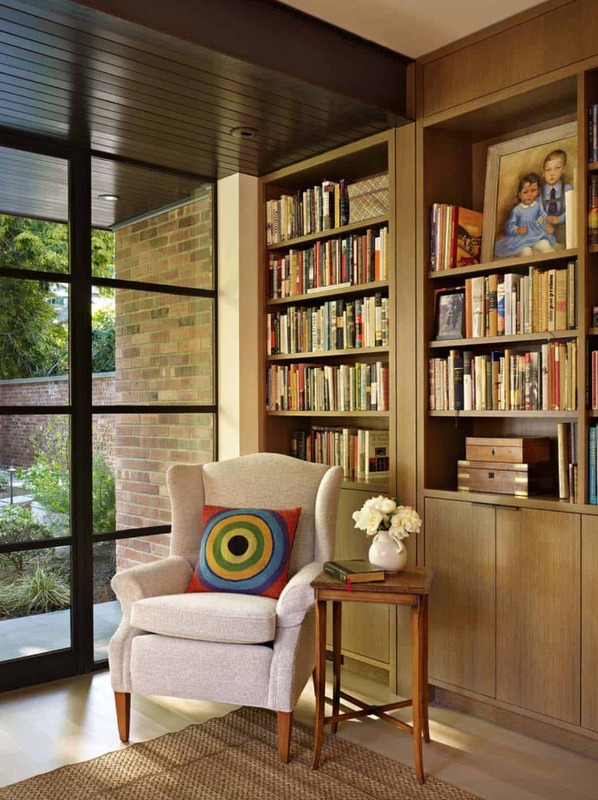 The design of this dwelling incorporates bookshelves and inviting seating areas throughout the interiors. Modern details complement traditional elements while steel windows, doors and exposed structure open the interior to light and views. 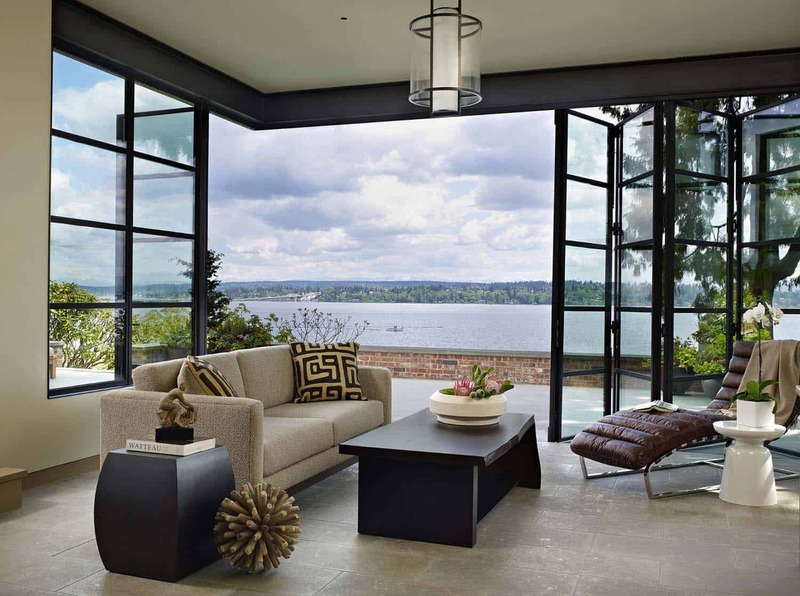 The exterior facade showcases a ‘secret garden’, sunroom and terrace, all of which overlooks beautiful Lake Washington. 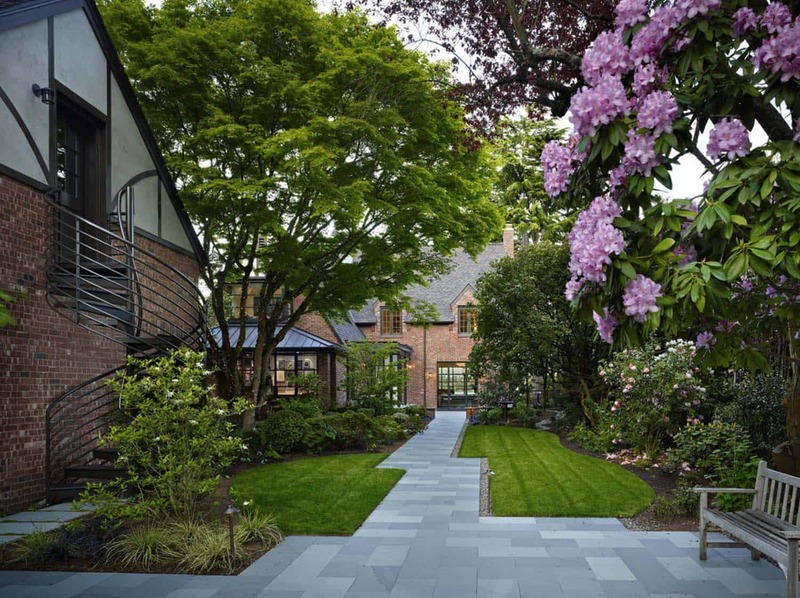 This project was awarded first place – Northwest Design Awards. 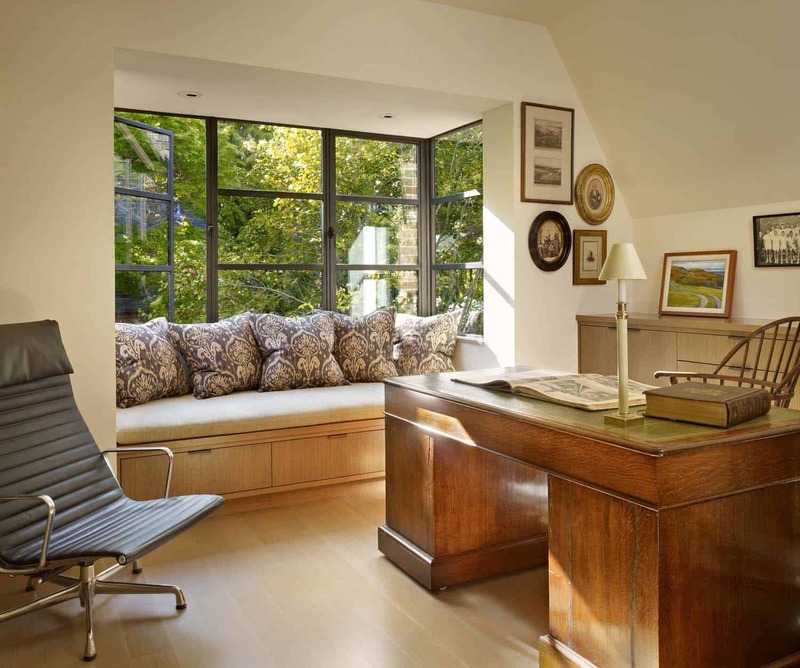 What We Love: This beautiful Tudor home was fully renovated to offer its inhabitants warm and comfortable living spaces. 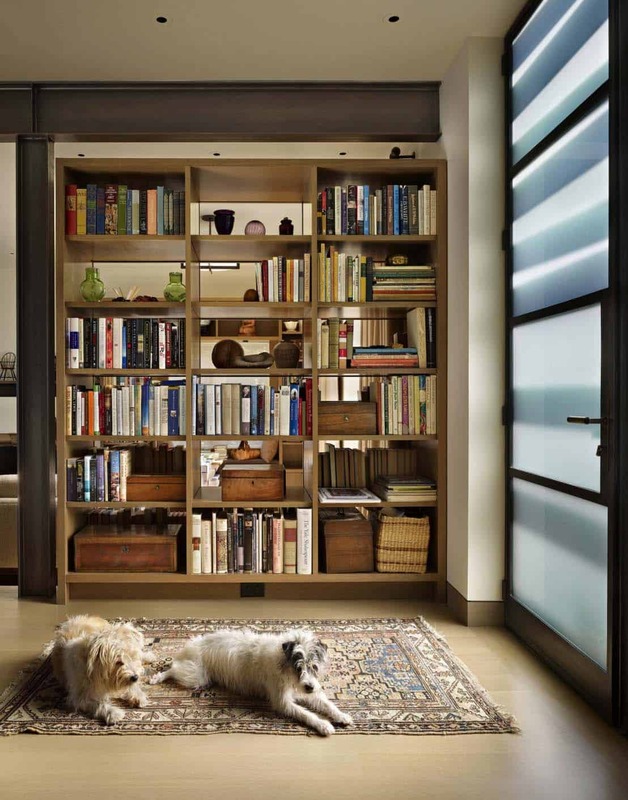 Bookshelves are abound in this home, inviting one to curl up with a good book while enjoying the company of dogs. 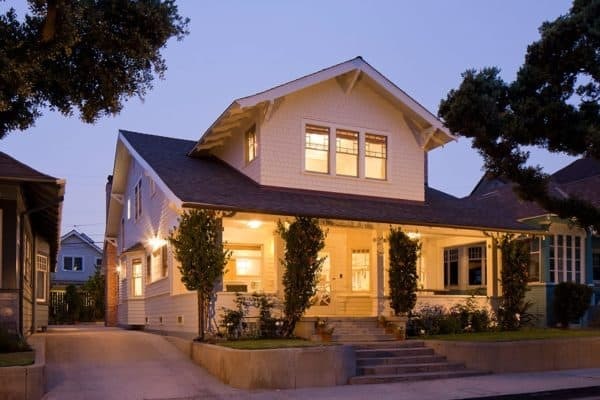 We are loving everything about this home, the architecture of the exterior facade is simply stunning… Readers, what details of this home do you find appealing? Please share your thoughts in the Comments below! 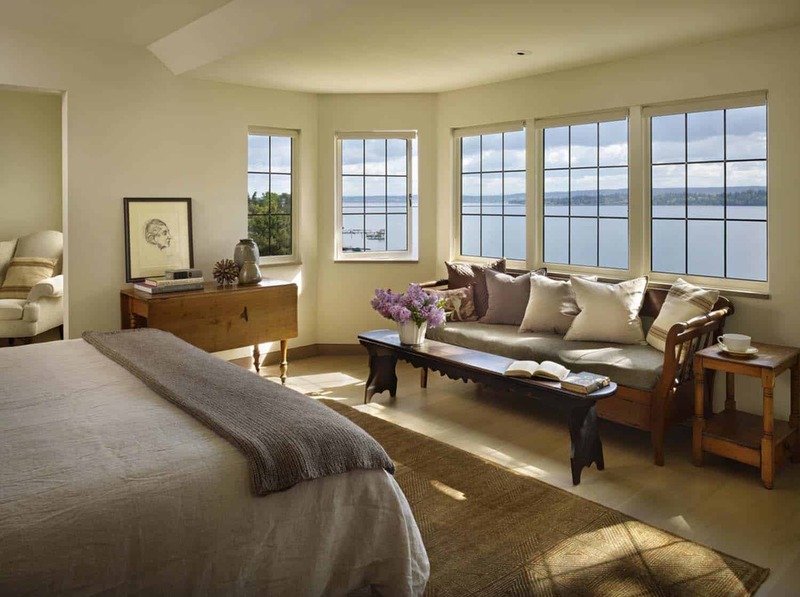 Note: Have a look at a couple of our favorite home tours that we have featured here on One Kindesign from the award-winning portfolio of DeForest Architects: Modern rustic retreat designed to feel like a summer camp on Orcas Island and Exquisite nature-inspired modern retreat in Oregon’s high desert. 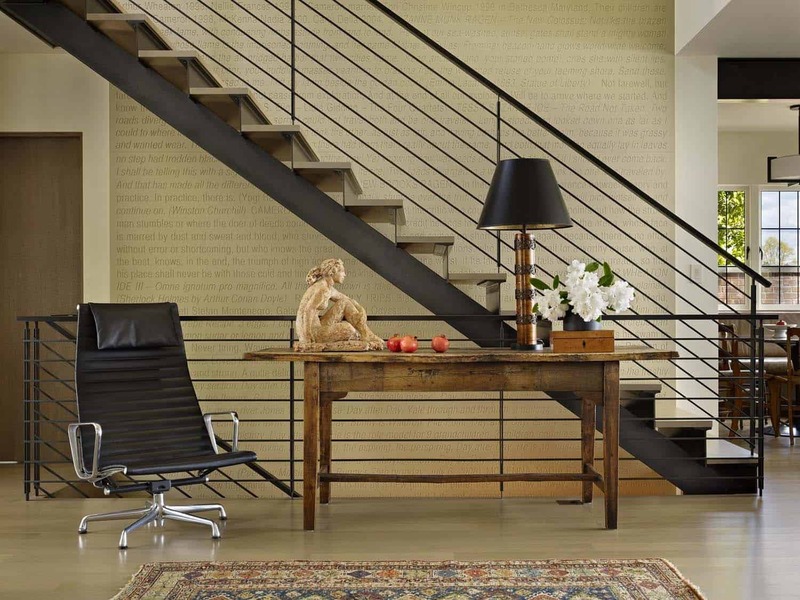 Above: Throughout the interiors, the walls and ceilings are painted in Benjamin Moore’s Linen White. Coffee table is the O Series Coffee Table by Antoine Proulx, while the sectional was custom made in collaboration with a local Seattle fabricator, Village Interiors. Behind the sectional is a swing door with two sidelites. Similar doors and windows are made by Dynamic, Hopes and others. The built-in cabinet is by Woodway Woodworks & Cabinetry. Grounding the space is a hand-knotted wool rug that was purchased at: Driscoll-Robbins in Seattle. 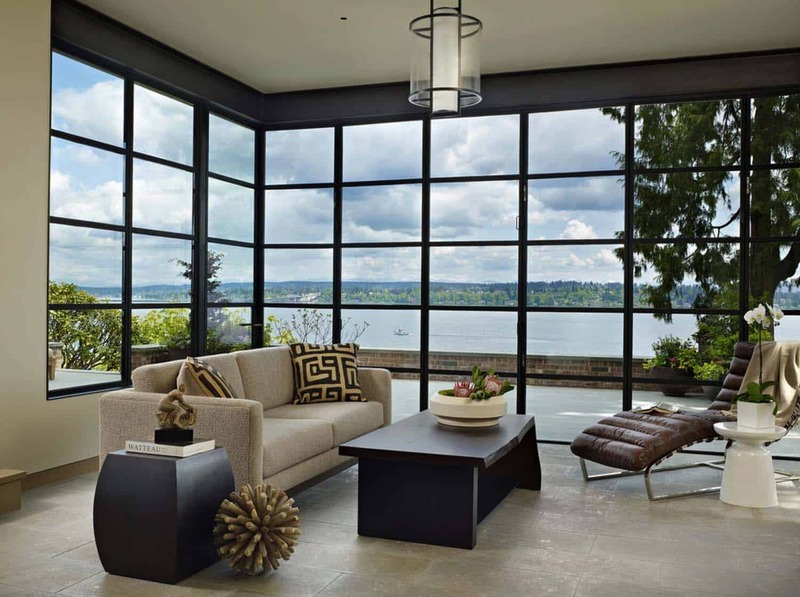 The light fixture is the Crosscross Pendant from Boyd Lighting. Dog bed is from Perennials—their outdoor fabrics work great for high-wear and maintenance. Above: The ceiling fixture is a Garda Hanging Lamp GRO-HL from Holly Hunt. Sofa pillows are from Wisteria. They are the Kuba Cloth pillows. The flooring is ‘Buxy” limestone. Above: The steel windows and doors were made by a company that no longer exists. Similar doors are manufactured by Hopes, Dynamic, and Architectural Traditions. Above: The tab pulls on the kitchen cabinets are from Mockett. The countertop is a honed quartz countertop from Pental, the color is “Canyon”. For the banquette, the cushions are leather. The base structure is oak and steel. The windows in the kitchen are Marvin windows with lead strips added to the interior to echo the traditional ones. Where the strips were needed on both sides, Dynamic windows were used, as they have a more realistic-looking leaded glass window. Above: The engineered wood flooring is riftsawn white oak with a custom-mixed stain. This project has hydronic heat under wood, tile, and concrete floors. Above: The dark ceiling is painted in Benjamin Moore 2114-10 “Bittersweet Chocolate”. Above: The windows in the master bedroom are from Marvin. They have leading on only one side of the insulated glass. 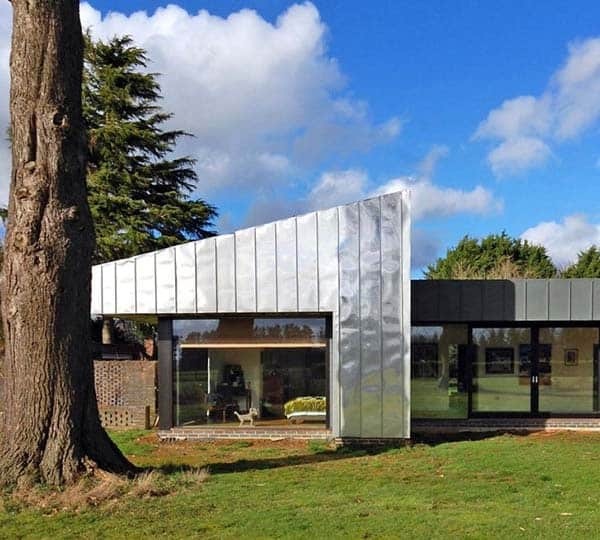 Where it was important to have the leading on both sides, the architects used Dynamic. The steel doors and windows were made by a company that is no longer in business. Above: The sink faucets and tub filler are both from the Dornbracht Tara Logic line. The countertops are quartz composite. The specific product at the time was Chroma Quartz BS 160H from Pental, while the cabinets are rift sawn white oak. The vanity is 8′ long and about 4′-4″ from the tub. The mirrors are a simple steel angle frame, custom designed and fabricated. The sconces are Carbon Canyon Sconces by Marian Jaimieson. The tub is an Iris Cast Iron Bath #2155 made by Cheviot Products. The baseboards are a stained white oak base set flush with the drywall. 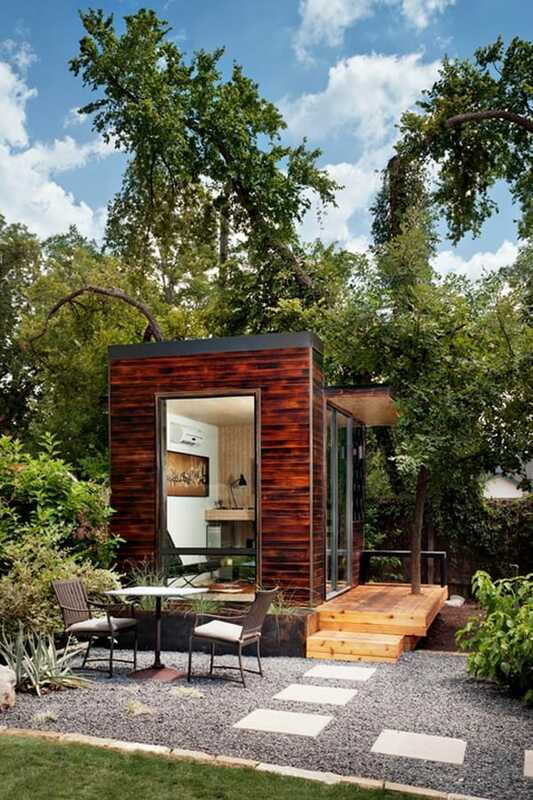 Totally agree that this houses’ interior and exterior are amazing. Beautifully done.